Help! I've lost my jewelry making mojo! After months of having more ideas than I could possibly keep up with - nothing! Nada. Zip, Zilch...Cue the crickets! OK, enough of the drama. That's not entirely true. There are some ideas floating around up there - but nothing that is getting executed. And certainly no where near the artistic flow I was experiencing before my summer travels began. It's frustrating. How do you break out of your slump?! For me, I need to get back in touch with my materials. I need to see them, touch them, get enthusiastic about them! And that means... ORGANIZE!!! I've already organized a lot of my beads - and the system is working. I love the Darice containers. They are a great size, I can see what I have in them and they are very portable. I have also purchased some new bead organizers Portable Bead & Craft Storage Box With 52 Removable Compartments which have different sized containers - and they are working well to hold my findings, hanks of seed beads, etc. Now that I've started dabbling with Kumihimo weaving, it makes sense for me to organize my stringing materials. I have C-Lon cord and thread for stringing, macrame and kumihimo. I have stretch magic elastic cord in several sizes that I use mostly for restringing bracelets for friends. There's also the Beadalon and Soft Flex coated wire. And spools of copper (there's only one shown below, but I just remembered where the rest is - and the artistic wire too!). 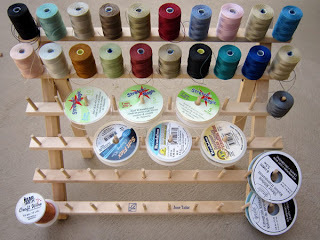 And spools of ribbon that I like to use when I package my jewelry for shipping or for gifts. The rack I am using is a June Tailor Mini Mega-Rack ll thread holder and is pure genius! I stand it on the table when I'm working, or hang it on the wall above the bookcase that holds all of my beads and findings. I love being able to see all of the thread colors and hold them up to the beads to decide what to use. I am pretty sure I could even put hanks of seed beads or hang strands of beads on it. But I'll need a separate one for that!! Most of all, I'll know where everything is! I hate when I decide I want to make something and spend the first 30 minutes looking for the materials. That can kill the creative process! I don't quite have my jewelry making mojo back, but I'm working on it. I'm hoping to post some new projects soon. If you have any hints on how you get your creative juices flowing - I'd love to know! In the meantime, I'll be shopping and organizing. Oh yeah, and reading. That always helps inspire me. I just love the rack. Thank you so much for sharing. I have all the c-lon colors and this way they would be much easier to get too. When I lose my mojo I look at other peoples work. I go to our local museum and see beautiful antique necklaces and earrings. I take out all my jewelry books and appreciate the wonderful creations of the authors. I never throw out my jewelry magazines so I go through those too. These things have worked for me, I hope they help you too. I bought a neat ribbon organizer that stands upright or hangs on the wall. It has about 5 horizontal rods about 18" long, and it is PERFECT for rolls of wire - I can unroll what I need without taking them off the rack, or just lift one end of the rod out of its slot and slide the spools off to get to the one I want to take elsewhere. Another fun one is the clear plastic ribbon file box (maybe Joann's?) that has the right space to store ribbon spools next to each other in vertical slots. One more fun one - I use my late husband's pipe rack (as in tobacco pipes) for tools - one leg of the pliers fits into the hole where the pipe's stem went. With maybe 12 holes in the wooden rack, I can usually fit 20+ tools. It is sentimental but also functional.